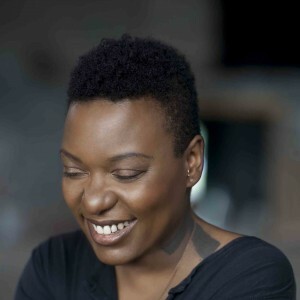 Meshell Ndegeocello is an American singer-songwriter, rapper , bassist, and vocalist. Her music incorporates a wide variety of influences, including funk, soul, hip hop, reggae, R&B, rock and jazz. She has received significant critical acclaim throughout her career, and has had ten career Grammy nominations. She has been credited for having “sparked” the neo-soul movement. Ndegeocello was born Michelle Lynn Johnson in Germany, to army Sergeant Major and saxophonist father Jacques Johnson and health care worker mother Helen. She was raised in Washington, D.C. where she attended Duke Ellington School of the Arts. Ndegeocello adopted her surname at the age of 17, which she says means “free like a bird” in Swahili. Ndegeocello honed her skills on the D.C. go-go circuit in the late 1980s with the bands Prophecy, Little Bennie and the Masters, and Rare Essense. Going solo, she was one of the first artists to sign with Maverick Records, where she released her debut album, Plantation Lullabies. This recording presented a distinctly androgynous persona. Her biggest hit is a duet with John Mellencamp, a cover version of Van Morrison’s “Wild Night”, which reached No. 3 on the Billboard charts. Her only other Billboard Hot 100 hit besides “Wild Night” has been her self-penned “If That’s Your Boyfriend (He Wasn’t Last Night)”, which peaked at No. 73 in 1994. Also in 1994, Ndegeocello collaborated with Herbie Hancock on “Nocturnal Sunshine,” a track for the Red Hot Organization’s compilation album, Stolen Moments: Red Hot + Cool. The album, meant to raise awareness and funds in support of the AIDS epidemic in relation to the African American community, was heralded as “Album of the Year” by Time magazine. She has appeared on numerous recordings and can be seen in the documentary Standing in the Shadows of Motown, singing The Miracles’ “You’ve Really Got a Hold on Me” and The Temptations’ “Cloud Nine”. Following the release of 2011′s critically acclaimed Weather, Meshell Ndegeocello announces the release of her 10th studio album, Pour une âme souveraine (“For a sovereign soul”), a dedication to fellow musician Nina Simone. She’s someone we’d like to talk to at WMTS. She probably uses line 6 dt25. ← What About A Wedding Ring For Him?